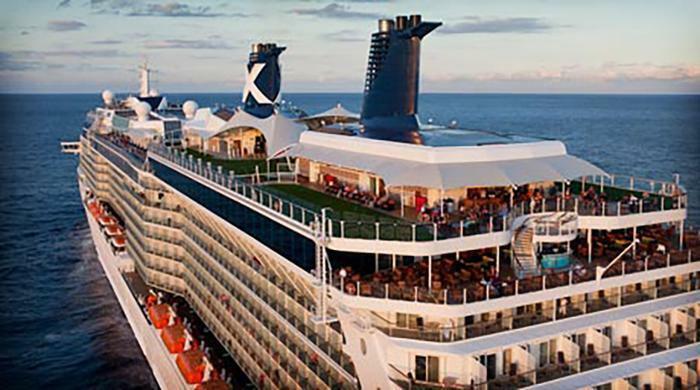 Celebrity Cruises bills itself as “Modern Luxury,” and their ships are contemporary and beautiful. They provide stellar service, wonderful itineraries, and I’ve sailed them seventeen times in the past ten years. Celebrity has five ships in the Solstice Class, which carry between 2,850-3,046 passengers, and four ships in the Millennium Class, which carry 2,170 passengers. The Solstice Class ships are newer, but all Millennium class ships have been “Solsticized,” updated and enhanced with the same lovely amenities and features of the Solstice Class ships. Café al Bacio is the onboard coffee shop. While there is a fee for all specialty coffees and teas, the beautiful muffins, pastries, and cakes in the display case are no charge. Get your coffee or tea to go or find a seat to sip and relax. The AquaSpa Café offers spa-inspired cuisine for breakfast and lunch. You can order an egg-white omelet for breakfast or salmon for lunch. Healthy breakfast foods and lunch-time small plates of fresh fruits and diverse salad options are available buffet-style. Smoothies, fresh-squeezed juices, and yogurt parfaits are for an extra fee. I love to watch the sun rise from the Oceanview Café. It is the all-windows buffet-style restaurant, with coffee, tea, and juices available 24 hours a day. They offer an early-riser breakfast, and if you want the fresh cinnamon-buns, get there early. There is something for everyone for every meal, even gluten-free options. Don’t miss tea at 4:00 pm each day with scones, finger sandwiches, and petite desserts. For an elegant evening, you can’t miss with a dinner at Murano. It is a contemporary French specialty restaurant and there is an extra charge, but it is worth it. The décor is lovely, service is superb, and the food is delicious. I love the Dover Sole, and for dessert, crepes with strawberries and ice cream prepared tableside. The Celebrity Silhouette and Reflection have the Lawn Club Grill, a unique specialty restaurant that encourages guests to get involved. You can work with a chef and make your own flatbread, like pizza dough, tossing it high into the air. You can also be your own "Grill Master" and work with a Celebrity chef to grill your own meal, garnering helpful grilling tips along the way. An extra fee applies. Each evening you’ll receive a “Celebrity Today” in your cabin, along with turndown service. Use it to plot our what you’d like to do the following day. There is no reason to ever be bored; watch a movie in the theater, check out a book from the library, join a game in the game room, exercise in the gym, play a sport, listen to a musician, attend a show, do some shopping, book a spa appointment or exercise class, take a dance lesson, place a bid at an art auction, and party as hearty as you would like. Or be like me: grab your book and head to the AquaSpa pool and unwind in a comfy lounge chair. Before you know it, you will be so relaxed you’ll be taking a snooze, my favorite cruise activity.